The meeting officially runs November 1-4, but Saturday is filled with pre-meeting workshops, field trips, and social receptions for colleagues and friends to reconnect. I spent the day getting some important activities out of the way: (1) picking up my name badge; (2) picking up a copy of the conference program; and (3) doing a final check of my uploaded presentations in the Speaker Ready Room. Students, I know you all know what a name badge looks like. 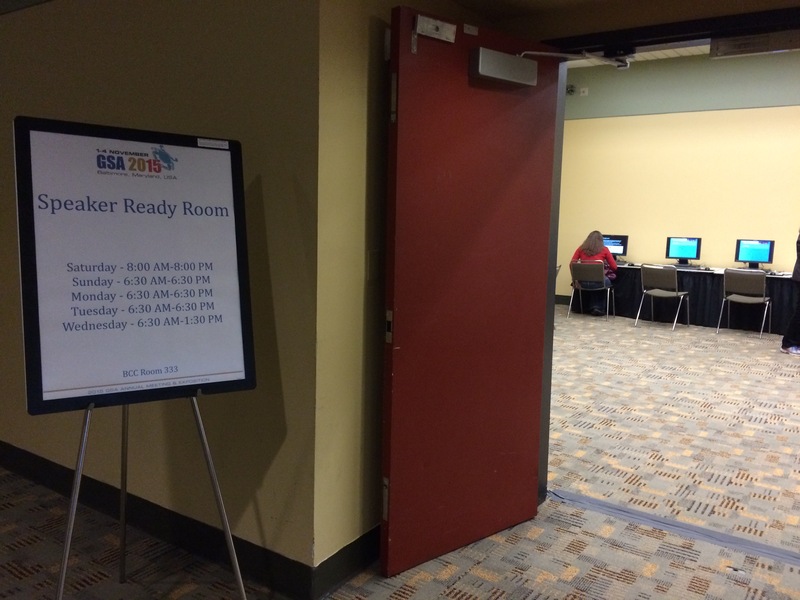 These are a little fancier than what you get a student conferences, as each badge has a type of bar code on it, so that vendors and organizations in the Exhibit Hall can scan your badge and immediately have your full contact information to send items via email or snail mail. The conference program book is getting thicker and thicker each year! 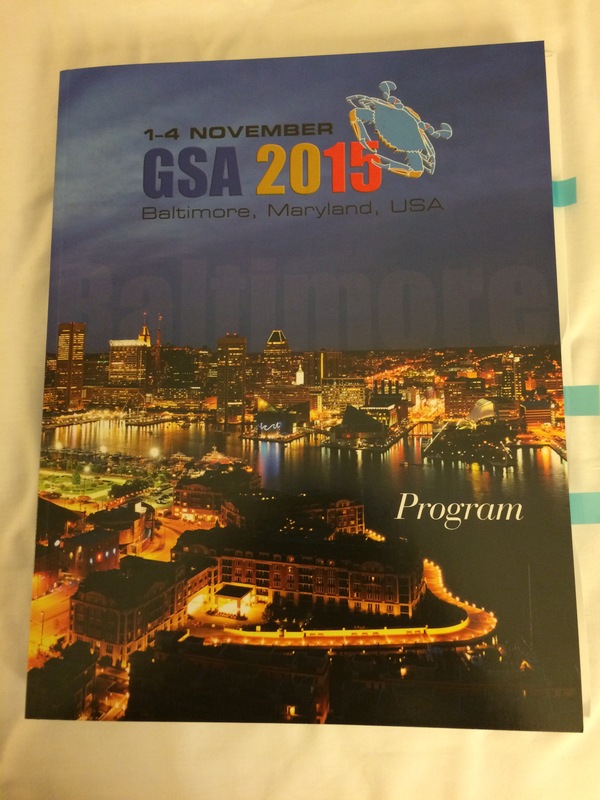 This year’s 352-page program lists important conference information, such as floor plans of the Baltimore Convention Center, locations of special talks and luncheons, safety information for the city, and the titles, names, days, times, and locations of all presentations being given this week. Although I spent the evening going through the program book, I think I’ll rely on the conference app to track my daily schedule and make sure I get to where I want to go. I’m giving two oral presentations at the conference on Tuesday morning (I’ll discuss more about the session and the content of the talks on Tuesday). One very nice service GSA has is that you can upload your PowerPoint online before you even leave for the conference, and once you arrive, you can double-check and make sure all of the formatting came through A-OK to show on the convention center computers. Each presentation room has one screen for speakers to show their slideshow during their 15 minutes for their talk, and all of the talks are pre-loaded onto computers in the rooms so there are quick and easy transitions from speaker to speaker. I had uploaded my presentations last week, and I’m very glad I took the time to review them – some of the fonts/spacing/formatting was not the way I wanted it to appear (sometimes, it’s just a Mac/PC issue). But after making a few quick edits, I’m now feeling quite relieved that my presentation materials are set and ready to go! 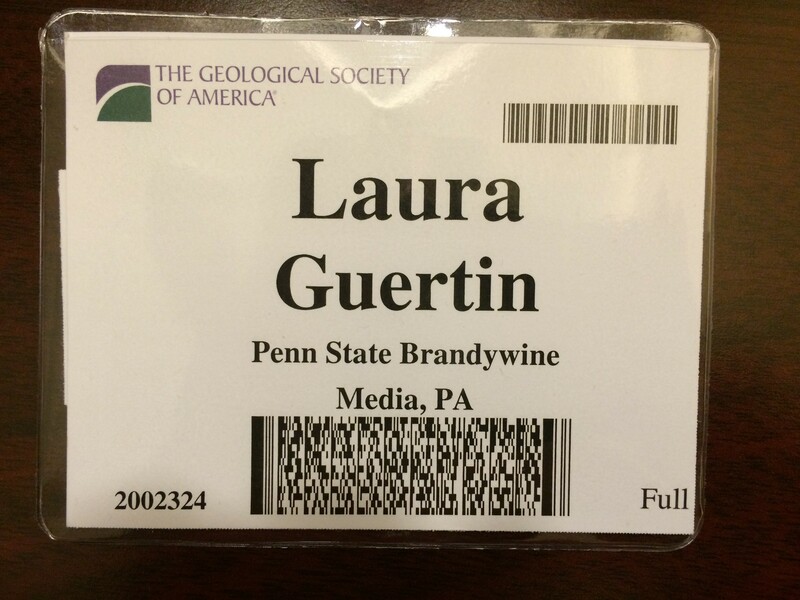 By the way, students, if you want to read what other bloggers have to say about GSA 2015, check out the blog roll GSA has set up, and feel free to explore and learn even more! Next up… one busy Sunday (the first official day!) of GSA! After a quick review of the conference Daily News email that GSA sends out every morning, I’ll be on my way (and double-checking to make sure I set my watch and all of my electronic clocks back one hour for daylight savings! ).